During the past centuries the Rhine has undergone considerable structural and functional changes. Its expansion to the busiest and most important European inland waterway starting 130 years ago and its use for industrial draining starting around the same time caused the river to become increasingly desolate ecologically. Due to far-reaching measures the Rhine is again in good shape today. The vision of a river which can tolerate all the uses assigned to it in the long run has come within reach. 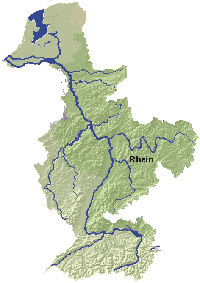 the Rhine is an indispensable and irreplaceable source of drinking water. The Rhine should again become a native habitat for more fishes. This not just presupposes good water quality but also the removal of obstacles at sluicegates and weirs to facilitate migration of fish. Flood protection along the densely populated shores of the Rhine is gaining importance. The protection of human life and material values should be improved. At the same time changes in the course of the river due to construction and climatic changes will be taken into account.